This extraordinary place is famous for its amazing wildlife, stunning scenery, and superb walks. From the simple beauty of the Lady's-slipper Orchid to the shining sands of Morecambe Bay, the area is simply awe-inspiring - full of natural spectacles and a surprise around every corner. 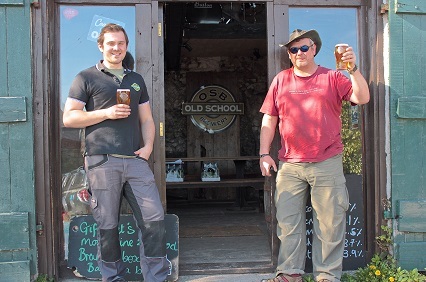 The Old School Brewery has been crafting beer on Warton Crag since 2013. Based in Warton’s first school – the Boys’ Grammar – the beer is brewed in what was once the ironwork and woodwork building, and the Crag actually forms the back wall of the Brewery! Originally the OSB team made cider using local apples, but were put off by the amount of preservatives and sugar needed, so sought a purer product. They launched their first beer in 2012; Detention. Carrying on the school theme with pale ale Hopscotch, blonde beer TextBook, best bitter Headmaster and numerous specials like Playtime and Truant. OSB now supplies pubs and supermarkets across North West England, and are a firm favourite at local beer and music festivals. Barley, hops and malt are not grown locally, and the team: Ian Walsh, Managing Director; Ren Wallbank, Sales Director; Sean Fletcher, Brewery Manager; and Garth Whittaker, Head Brewer; carefully choose ingredients from all over the UK and further afield to create the distinctive flavour of each beer, blending with local water which is very clean and pure. Keeping it local, the leftover malt goes to the local farmer to feed the cows. As well as bottled beer, OSB beers are available on tap in some local pubs, including the OSB’s own bar which holds an open evening on the second Friday of every month, and live music nights on the last Friday of each month. Wine, cider, spirits and soft drinks are also available.